After one of a number of live presentations at a private Christian school in Plano, TX, I had the opportunity to take a much needed break before my next presentation at 1 p.m. sharp. But just before the 1 p.m. presentation, an excited teacher approached me and showed me something remarkable. He showed me his smart phone. On the screen was this image. 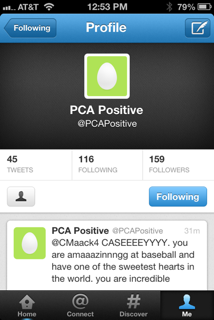 It’s a new Twitter account called “PCA Positive.” This account, which began no more than an hour earlier, only posts positive, supportive and uplifting comments and information about fellow students. And to my surprise, it already had 159 followers. In less than one hour! This is just one example of how The Protectors is changing the DNA of Christian schools, making them beacons of love, light and hope in a world growing increasingly uncivil and cruel. No organization, faith-based or not, is immune to bullying because wherever 10 or more gather, statistically there is bullying, which is the only form of intentional abuse that we tell the most vulnerable among us to “just ignore.” God’s heart and will is with the targets of bullying, and He is outraged when no one intervenes on their behalf (Isaiah 59:16). To Him, bullying is more than wrong. It’s evil. And as you’ll learn in upcoming messages, numerous families are actually leaving church due to this intentional form of abuse that many church leaders and volunteers do not know how to recognize or effectively intervene against. We want to help more Christian schools and related organizations diminish bullying—but we currently cannot meet the tremendous need. Many Christian organizations can’t afford our entire program. That’s why we created our introductory, Hero in You faith-based DVD and curriculum. Through this upcoming and inexpensive resource, more organizations will be able to spread God’s love, mercy and justice. But we need your help to complete this resource that is unlike any other in the United States. Looking for a cause you can really sink your soul into? Partner with us today and help give the gift of freedom now and for generations to come. Click here: Here in You Faith-Based Anti-Bullying Program. Campaign ends December 31.